Labour efficiently and effectively applied... it sounds simple and there is no earthly reason why, with the application of science and goodwill, it should not be achieved. But the requirements are precise, and unyielding: everybody working, everybody working productively, which in turn requires reliable investment and stable money neither of which we presently enjoy. Job evaluation, now well tried and widely practiced, links pay with the requirements of the job. Applied nationally and in standard format, Job Evaluation can ensure wage stability. With limitations set on retained profits, a clear relationship between production cost and selling price is established, thus ensuring price stability. Increases in productivity, less work for the same or greater output, are reflected directly in lower prices, resulting in increased purchasing power and standard of living for all. The results would be seen in full employment and monetary stability, with a high level of productive efficiency reflected in a continuing fall in the cost of living and a parallel increase in overall prosperity. 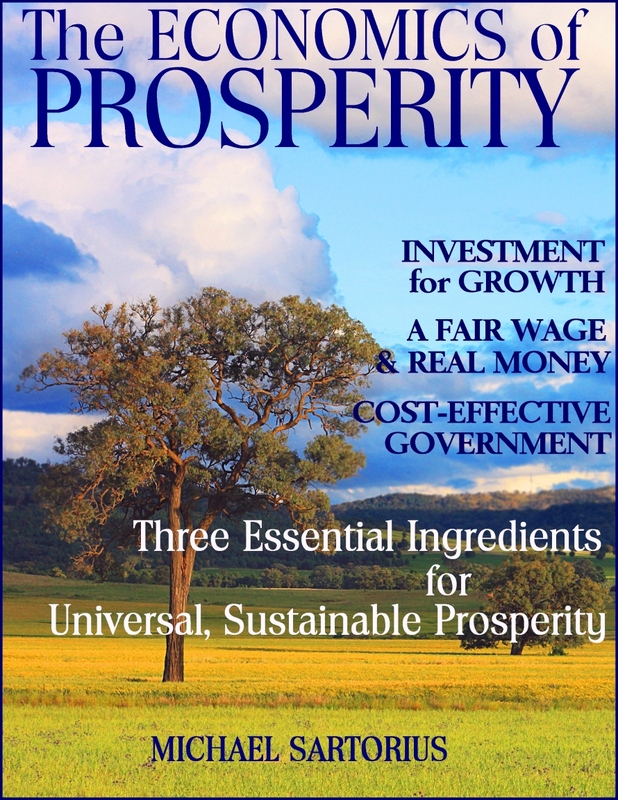 Prosperity is created through productivity: producing more and better goods and services at less cost. And given the right investment facilities combined with economic stability we can do this... but only with half our economy. For the other half consists of the great meandering world of government. Unknown in government circles is the P-word  Productivity  the concept of striving continuously to give a better service at less cost  a concept taken for granted throughout the business world. So the burden of government, its size and its cost, steadily increases, while service quality stagnates or deteriorates. Yes its possible. Here. Right now. And the key, not surprisingly, is money. Job-creation requires capital  in sufficient quantity and with guaranteed longterm financial reliability to ensure that a business is properly set up, and able to maintain the highest international standards in design, production and marketing. Our current banking system does not provide this. The fact is simply stated: banks are private institutions whose function is to make money for their directors and shareholders. Serving the needs of the nations economy is not their prime concern. In fact quite the contrary. Bankers tend to shrink from involvement in an economy suffering downturn or recession. As bank loans are reduced or refused many a business has found bitter truth in the old saying that banks lend you an umbrella when its sunny, and take it away when it rains. A dedicated Development Banking sector can spread growth across the nation, creating jobs and providing the wherewithal for existing companies to increase their competitiveness, as well as for infrastructural improvements. Investment targeted regionally can bring industry and growth to traditionally under-developed areas. Traditional banking practice requires pre-existing assets as security, and loans carry no long-term commitment. Development Banking avoids these two limitations of traditional banking by securing the loan on the industrial or commercial project itself, thoroughly researched and costed, and by making a long-term commitment based on an intimate knowledge of, and involvement with the business or project in which it is invested. This facilitates the creation of new business and new jobs, as well as providing secure finance with which existing business can maximize quality and productivity. And unlike government grants and incentives, development through phased repayable investment does not swell the deficits of indebted governments. By setting up multiple Development Banks to operate at regional level, focusing on regional and local needs, the benefits can be spread widely and uniformly, avoiding the usual geographical pockets of non- or under-development. Local infrastructure can also be financed. Many of todays successful businesses grew over many years and a long hard climb, starting with minimal capital, operating on a shoestring, and reinvesting every penny of profit. Industrial Development Banking can provide sufficient capital for a good business venture to start at full operation, properly equipped to ensure the high level of productivity which creates real and lasting prosperity. Development Banking can also finance infrastructure improvements, improving the working-living environment and creating jobs without adding to the overall deficit, as many examples, historical and on-going have proved. Napoleon III became President and self-styled Emperor of France in December 1852. Industrialization and scientific discovery were already gaining pace in Europe. This in turn required that banking should promote industry and infrastructure, in contrast to the existing banking system in France which was almost exclusively, and very conservatively managed under Baron James de Rothschild. The newly established Crédit Foncier and Crédit Mobilier financed and promoted investment in the expansion of the textile, chemical, steel and metallurgy industries, and agriculture. The rail network increased from 3,000 km in 1852 to 18,000 km in 1870. In 1818 the Swedish government offered 160,000 Taler to Westphalia as reparation for damages incurred during the Napoleonic Wars. This money was decreed the property of all Westphalia by its President, and the Westphalian Hilfskasse, or “Assistance Bank” was established to develop the regions economy and pay for public-works projects. Witnessing its success, the king of Prussia ordered that a similar bank be created in the Rhineland in 1847. Both banks later became Landesbanken (Regional Banks), and were instrumental in making the Rhine-Westphalia region one of the most productive industrial areas in Europe. In the post-WW2 years, the Landesbanken again played a major role in the creation of Germanys Economic Miracle, in particular through the provision of secure on-going finance to the German Mittelstand (small and medium-sized companies) in their respective regions. With 3 million mid-sized businesses the Mittelstand industries employ more than 70% of German workers and contribute roughly half the countrys GDP. Founded in Basque Spain in 1956, the Mondragon Cooperative group clearly illustrates an ongoing relationship between investment banking and recipient business. The Workers Bank provides investment as a local development bank, offers technical and financial advice for business startup, then monitors production, quality, and financial performance in a process of ongoing cooperation and partnership. This also assumes longterm commitment, ensuring finance for secure long-range planning and productivity investment, research and development into new-generation products and services, in conjunction with apprenticeships and higher education which are also sponsored by the Cooperative. The group now employs 85,000 workers with a turnover of 15 Billion Euros. The concept of loans based on, and secured by the project itself backed by continuous monitoring is basic, simple, well-established and proven. It can create secure, productive jobs, economic expansion and productivity anywhere without increasing government debt. And as companies securely financed and confident in the future seek to ensure continuing quality and productivity, they will, as already happens in Germany, take on young apprentices, sending a positive signal to young people and providing the prospect of a challenging, well-paid job as the sure reward of education. Dedicated, Project-secured Development Banking can make it happen. Gross and growing inequality of income and wealth is becoming an increasing cause for concern, particularly highlighted during recent financial upheavals. Bankers and financiers gained notoriety as they drew huge bonuses for their near-destruction of our entire economic structure  after the taxpayers had bailed them out. And the bankers arent the only ones. As of 2016 the richest 1% of the world's population now owns 50% of its total wealth, according to a report by Credit Suisse. Is inequality a problem? Not necessarily, not if it is the result of hard work, of training and education, acceptance of responsibility and simple success at what you do. But inequality of remuneration and consequent living standards does become a problem when it is widely perceived that there is no just and fair relationship between work and reward. A fair days pay for a fair days work  a fine-sounding slogan but hardly a reality today. The vast majority of working people slog away in factories and offices for the best part of their lives with nothing but a meager pension at the end of it  and even that may be in doubt. At the other end of the scale, the fat cats walk away with millions for having done little but presiding over a companys demise  and placing the Banking System in jeopardy. But the problem is very much deeper and more fundamental. The absence of any defined relationship between work and reward may be widely perceived as a failure of social justice, but it has effects far beyond those immediately apparent. One such effect is that we will never, ever achieve full employment  real full employment in the sense that anyone and everyone who wants one can get a productive, rewarding and challenging job. The fundamental problem is that our money has no defined value. Sound impossible? Well, what IS a Pound Sterling worth? Or a Euro, a Dollar? How do you define its value? The answer is that money has real meaning in terms of what you earn (wages), and what you can buy with what you earn (prices). But both wages and prices are open to continuing dispute, and lack any form of definition or stability. None of the worlds currencies has any stable, clearly defined value, and all are subject to a continuing upward movement known as inflation. Inflation is not the complex esoteric phenomenon economists would have us believe. It is simply a matter of human greed  our natural desire to get more reward for the same work. Inflation is an increase in price without a corresponding increase in value. If the price goes up for an improved product that costs more to make, that is not inflation. But if a producer asks more tomorrow for the same product he sold for less yesterday, that is inflation. Similarly with wages. More money for more or harder work is not inflation. Inflation is more money for doing exactly the same work. In todays economies, the level of economic activity directly affects inflation. When the economy is sluggish, producers and retailers find difficulty in moving their goods; they respond by introducing price reductions, incentives and special offers. But as the economy expands and consumer demand expands, prices can be increased without losing sales. Similarly with wages. Employees are naturally reluctant to demand more money, or threaten strike action, in a time of high unemployment with a lineup of job applicants outside the door. But when the economy approaches near-full employment and staff are hard to find, nows the time to demand that raise youve been wanting! As the economy expands and unemployment is reduced, wages are up, prices are up. In other words, inflation. The Central Bank attempts to control inflation by slowing down the economy with increased interest rates long before full employment is reached, especially in the less developed regions. So a measure of permanent unemployment is a fact of economic life. The underlying economic factor which puts us in this situation is that pay and prices are settled by a form of disputation. The price is as much as the producer can get, or as little as the consumer is willing to pay. Similarly, the wage is as much as the employee can get, or as little as the employer can get away with. This process is commonly known as free collective bargaining. But it is inherently unstable and subject to continuous upward pressure fuelled by the simple human desire for more. While the desire for more wealth and prosperity both personally and nationally is a very reasonable one, an economy and its participants should seek to increase their personal and collective prosperity by becoming more productive, by producing more and better goods with less labour, not by demanding more money for the same work or the same product. The process of establishing pay, profits and prices by disputation results in friction, industrial disputes, loss of productivity, inflation, and permanent under-employment. It represents a facet of anarchy, in that it is a process of settling differences by unregulated dispute rather than by a system of debated and agreed guidelines and regulation. Its damaging effects on the economy and prosperity are substantial and far-reaching. In addition to the hard economic effects, there is a growing social dissatisfaction with the increasingly visible discrepancy between work and reward. What, if any, are the alternative options? Full Employment. Zero Inflation. And a Fair Days Pay. A solution to this problem already exists, and in widespread use. It needs only to be applied on a single standardized national scale in order to bring stability and social justice to the economy. For many years, government agencies, and corporations large and small, have been using a system of Job Evaluation to evaluate the work contributed by each employee. Each job is analyzed, and its essential characteristics and demands, such as training, responsibility, working conditions and physical/mental effort involved, are measured on a series of common scales. The job value is then directly related to remuneration. In this way, pay is fair, both in relation to the work done, and in relation to the pay and the work of others. Currently there are several such systems in use, well tried and working successfully. All we need do is analyze and compare their different features to establish a single standard. This would become in effect a National Standard of value for measuring the work element contained in a product or service, so that pay becomes a true reflection of the work required of a job. Society already measures apples and milk; it could hardly get along otherwise. Yet of all the commodities traded every day, work is the most important, and work is the one commodity we dont measure. A national standard of job/work evaluation would provide a point of reference, of justice indeed. Everyone would know how much they should get for the work they do, without hassle or argument or strike. Thats a first step. But a fair wage has meaning only in terms of a fair price. The evaluation process must now be carried through to price evaluation. A fair wage, a fair price. A factorys, or a businesss total costs consist of three elements. First, the cost of bought-in raw materials and components; second, the direct labour added in the factory; and third, the costs of capital write-off, overheads and finance. These are the costs of making a product, of supplying a service. From these costs a Unit Production Cost can be calculated for each product or service supplied. If this Unit Production Cost then becomes the Selling Price, there would be a direct and fair relationship between cost and price, and therefore between pay and purchasing power. But the Unit Production Cost is not normally equated with the Selling Price. The difference between the two is commonly referred to as the net profit. How is the net profit then disposed of? The prior recipient of profits are the investors, or shareholders. A part of company profit is also re-invested either in research and equipment or increased working capital. The stabilization of prices would require the establishment of public policy for profit distribution. This could take the practical form, first, of an overall profit ceiling. Of the profit made, broad percentage bands could be established and gradually stabilized, distributing profit according to a pre-set formula as between investors, the internal needs of capital for reserves and re-investment, and the customer reflected in lower prices. Guidelines for pay evaluation coupled with profit limitations would replace dispute with rules, and would move to stabilize pay and prices even in times of economic expansion. In such circumstances it would be possible to expand the economy steadily to full employment and hold it there indefinitely without fear of inflation. The results would be seen in full employment, monetary stability, with a high level of productive efficiency and thus prosperity. Inflation is a permanent feature of every world currency today, and though economists and politicians seem quite comfortable with its existence, inflation is a manifestation of gross monetary mismanagement, for it is a denial of one of the two basic purposes of money: that it should serve as a store of value. The longterm result of productivity maximization, combined with the stability of a labour-based monetary system, is negative inflation. Your money buys more each year, not less. As productivity increases, the labour-content decreases, and it becomes possible for goods and services to be produced and offered at lower prices, thus progressively lowering the cost of living. This in turn means that as we get older we can look forward to increased purchasing power for our savings. A wild dream? No. This is as it should be, the normal course of events. We should be increasing productivity, producing more and better at less cost. And with a stable monetary unit, increased productivity involving less labour is reflected in lower prices. Ultimately the idea of living in a society where the cost of living goes down slowly, year by year instead of up, where your savings are not only safe but increase in value, where your domestically produced goods get progressively better and cheaper, where a fair days pay for a fair days work in decent conditions is an accepted norm rather than an on-going battle... it may all seem utopian. But its possible. And perhaps one day we'll get around to it. Governments are among the most wasteful, the least productive of any organization yet devised by man. Why? It is simply human nature. If were not under pressure, its easy to let things slip. Throughout private sector business and industry, managements are under constant pressure to remain competitive. They cannot afford to let quality slip, to miss an opportunity to improve productivity, or to fill a new market need. No one accepts pressure through choice. The need arises only because competition can overtake a business, even cause its failure. Monopoly services do not suffer such pressures, so it is easy for service standards to stagnate or fall back. Yet there is an escape route for dissatisfied customers: you can always opt out. If your electricity supplier really annoys you, close the account and light your home with oil lamps. Inconvenient perhaps, but the option remains, for though a monopoly supplier, your power company cannot require you to use its services. It is not an enforced monopoly. It is in this respect that Government stands alone. Government is not only a monopoly, it is unique in being an enforced monopoly, there is no option to reject it, and refusal to pay its taxes will land you in prison. The simple result is that both taxes and government debts slide slowly upwards, services remain stagnant or decline, and government departments proliferate. Government is a service to its consumers and as such should be subject to the strictest possible commercial disciplines; its performance should be at least as good as and preferably better than the Private Sector. Any Commercial Legislation relating to accounting, standards, productivity or quality of Private Sector business and commerce should immediately and automatically apply to any and all functions of Government. Fair, yes. Logical, yes. But quite a revolution. Many existing government departments and programs would inevitably be abandoned as being non-essential, while each of those remaining would be required to state clearly what it is doing, what it is costing, and the extent to which it is fulfilling its stated objectives productively. Over the past twenty years just about every part of the world economy has been transformed by technology and new ideas, yet no sector anywhere has changed less than government. Government is simply too expensive, and poor value. We need change. One: commission a major firm of internationally recognized accountants to put governments accounts on a standard business footing. Then put every detail online, down to the last penny. Transparency is the first line of defence against waste. Three: ruthlessly eliminate the grants, projects, pseudo-government appendages  anything not directly essential to the good governance of the nation. Be ready to question the current usefulness of departments set up long ago and hanging on out of tradition and nostalgia  or simply lack of serious questioning. Government takes up to half the nations income. We need to ensure that it is wisely spent.